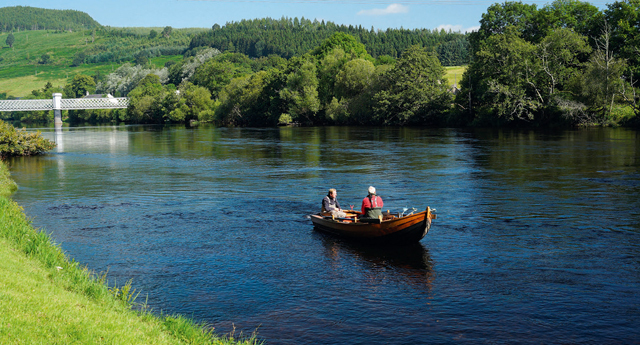 Scottish sporting dreams can come true at this perfect Perthshire estate. Imagine a 21st-century Brigadoon, the mythical Scottish village that comes alive for 24 hours every 100 years, only to disappear into the mist for another 100 years at the end of that all-too-brief period. Then, go a step further and imagine a legendary Scottish Highland estate, where you can live like an Edwardian gentleman in a handsome 18th-century house, surrounded by a 6,000-acre sporting estate where, if your luck’s in, you can bag a Macnab—shoot a stag, down a brace of grouse and catch a salmon in the same day. 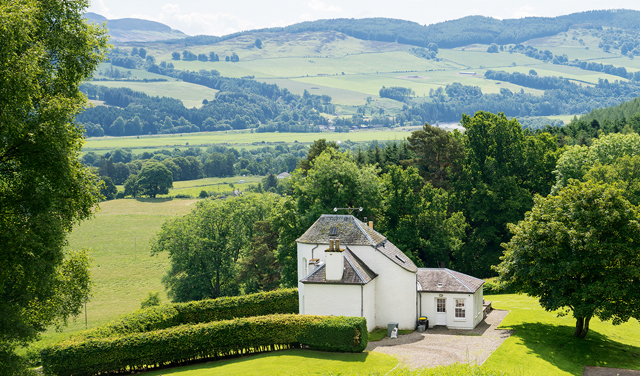 However, this is no myth, but the timeless Kinnaird estate near Dunkeld, Perthshire, which launched on the market in last September’s Country Life, at a guide price of ‘offers over £9.6 million’, through Knight Frank in Edinburgh (0131–222 9611) and Bidwells in Perth (01738 630666). A well-known Italian artist guest painted the floral arabesques in the dining room. Kinnaird was owned by the Stewart family from the early 1600s until 1773, when debts forced them to sell to a Colquhoun Grant for £1,700. Grant passed it to his brother, an Edinburgh physician, who, in 1798, sold it to Chalmers Izzet, a well-known Edinburgh hatter. Izzet built the earliest part of the present Kinnaird House, comprising the two-storey-over-basement, south-west corner overlooking the gardens, whose original form can be clearly seen from the drive. By all accounts, Izzet was a gracious host and several leading Scottish literary figures are known to have stayed at Kinnaird. James Hogg, Sir Walter Scott’s poet friend and protégé —dubbed the Ettrick Shepherd by the Edinburgh intelligentsia (a reference to his humble farming background)—visited in the summer of 1814, while making a tour of the Highlands. He caught a severe cold and was invited to convalesce at Kinnaird House, where Mrs Izzet, apparently much impressed by his literary talent, suggested that he should write something ‘to prevent his mind from rusting’. The result was Mador of the Moor, a Gothic poem written in the style of Scott’s The Lady of the Lake. There’s fishing on the middle Tay. Offers over £9.6m for the whole. Izzet held the estate until 1824, when he sold it to a James Stewart, who was probably related to the family who had owned it in the 1700s. Stewart bought it for £11,000 and sold it two years later to John, 4th Duke of Atholl, for £14,200—a size- able profit in those days. At the turn of the 20th century, the Atholl estates were slimmed down for the first time in centuries and, in 1927, Kinnaird was bought, for an undisclosed sum, by Maj the Hon Sir John Ward—the second son of William Ward, 1st Earl of Dudley— and Lady Ward, the daughter of Whitelaw Reid, the American ambassador to the Court of St James from 1905 to 1912. In 1928–29, Sir John had the house remodelled and renovated by the architect W. A. Forsyth of London architects Forsyth & Maule, who added a new main entrance, a new smoking room and a billiard room. An invitation to one of the elegant house parties held by the Wards at their new Scottish estate was much prized by England’s social and sporting elite. Lady Ward was keenly interested in the Arts and, at one point, invited a well-known Italian painter to stay. He was evidently an appreciative guest, for his legacy was the floral arabesques painted on the walls of the dining room. a farm, but it is hoped to sell it as a whole. 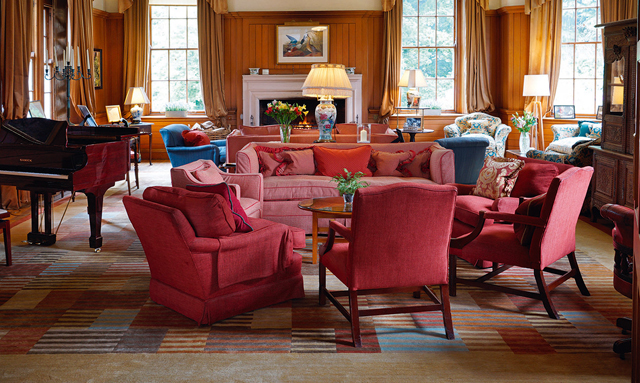 The estate eventually passed to Reginald Ward, who, in 1975, married Constance Cluett, a dynamic American who shared her husband’s plans to turn Kinnaird House into one of the world’s most exclusive small country-house hotels. Sadly, Mr Ward died before the project could be realised, but Mrs Ward soldiered on alone, opening Kinnaird as a Relais & Châteaux hotel in 1990. She continued to live in a house in the grounds and, with her daughters, oversaw the running of the hotel until, on turning 80, she announced her retirement in 2009.  Since then, Kinnaird has functioned as a luxury guesthouse with an enthusiastic international clientele. 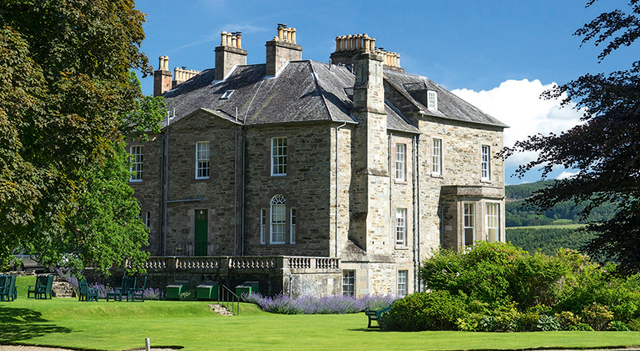 Following Mrs Ward’s death a couple of years ago, her daughters have finally decided to call ‘time’ on Kinnaird and this most perfect of Highland estates, a mere 1 1⁄2 hours’ drive from Edinburgh, is for sale for the first time in almost 90 years, either as a whole or in six lots. ‘Clearly, the hope is that the estate, which has been really well looked after throughout that time, will be sold as a whole. And although it could easily revert to a wonderful family home, it has excellent commercial possibilities, too,’ says selling agent Ran Morgan of Knight Frank. The heart of the estate is still Kinnaird House, which nestles under a pine-covered crag overlooking its 6,236 acres of sporting heaven that includes a renowned pheasant and partridge shoot—the drive of high- flying partridge known as ‘Over the Falls’ is one of the great shooting experiences at Kinnaird, Mr Morgan reveals—and four miles of fabulous salmon fishing on one of the most famous beats on the middle Tay. ‘With its great diversity, numerous income streams—which include a successful farming enterprise and a thriving holiday-let business—and a wide variety of sporting and residential assets, it’s hard to imagine a more rounded estate in Scotland,’ he adds. 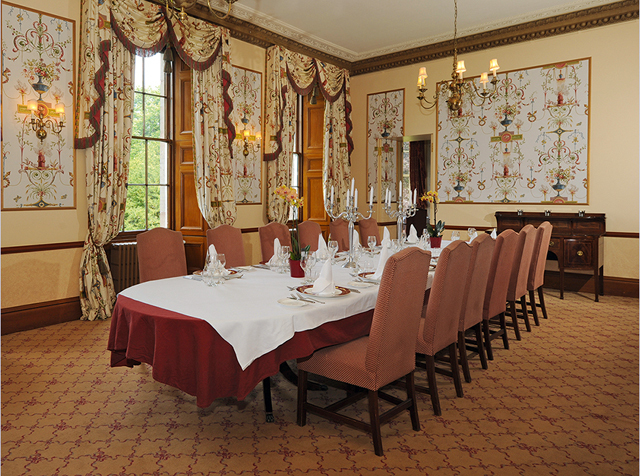 Unlike so many Scottish lodges, Kinnaird House has no rambling passages or draughty baronial rooms. The accommodation is well laid out, with no wasted space, and the house, which feels welcoming, but not huge, runs like a well-oiled machine, with six reception rooms, eight bedroom suites and a two-bedroom staff flat on the floor above as well as plenty of room for further expansion.